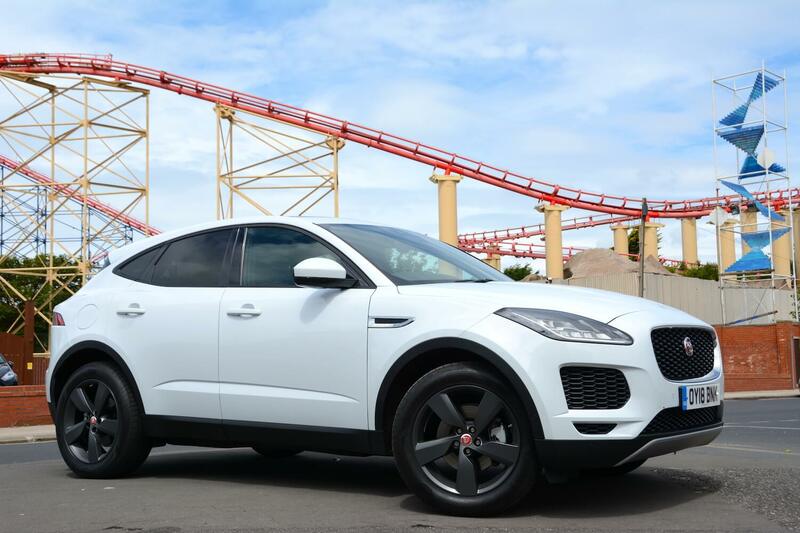 The Jaguar E-PACE is a more compact version of the F-PACE, and in diesel manual front-wheel drive form, delivers an economical – and a comfortable – driving experience on long journeys. 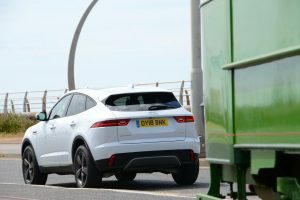 The Jaguar F-PACE is an impressive all-round SUV product, and now Jaguar is hoping to emulate this success with the more compact E-PACE. Has it achieved this goal? 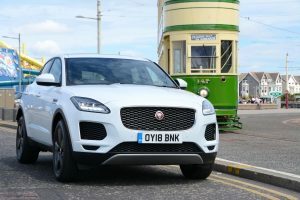 Our E-PACE test car featured a 4-cylinder, 2.0-litre turbodiesel engine with a manual 6-speed ‘box and front-wheel drive. The E-PACE looks good on the outside, with the rear being very similar to the F-PACE, but the front headlights being influenced by the F-TYPE. However at one point our car was parked next to another E-PACE which had very small wheels, which just didn’t look in proportion – so large wheels seem essential to make the design work. The interior is perfectly adequate, but relatively simple, and the dashboard is dark. 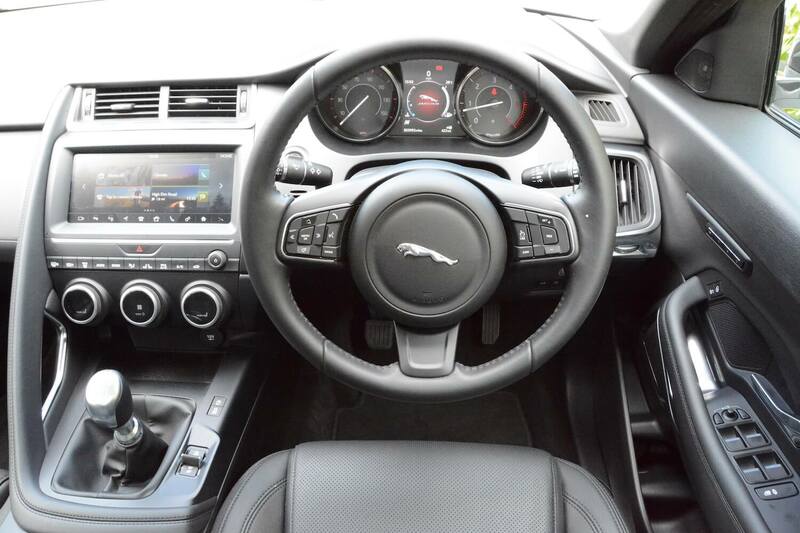 Presumably there is a need to separate the E-PACE interior from other, more upmarket JLR products. 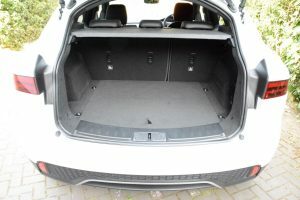 Despite being smaller than the F-PACE, the E-PACE still offers a practical amount of space, with a reasonable-sized boot. 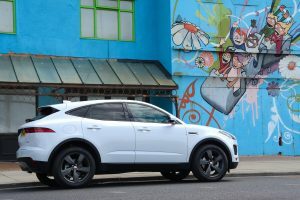 The E-PACE is a very pleasant place to spend time if you’re covering lots of motorway miles, when it’s quiet, refined, it has a comfortable ride, and as we’ll discuss later, with the 150PS diesel engine, it’s economical. However there’s not much performance, and when you turn off the motorway and head onto A and B-roads, you become conscious that, at 1,775kg, this is quite a heavy car. 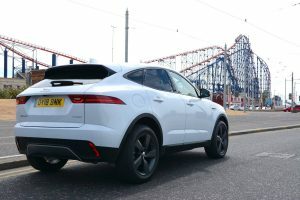 But despite this, the handling is actually good, and the steering is sharp, responsive and well-weighted – especially for an SUV – which means that it’s enjoyable (if not agile) to thread through the bends. When you get into urban areas, it can be somewhat ponderous trying to change through the gears quickly, and again, the weight of the car becomes apparent. This mass, in combination with the large (19-inch) wheels on our test car, can also result in the secondary ride becoming uncomfortable over poor surfaces. Because our test car was front-wheel drive, ultimately it wouldn’t have the all-weather grip of an all-wheel drive model. There’s a drive mode switch, in a convenient position on the right-hand side of the gear lever, and you can choose from the settings of Dynamic, Comfort, Eco or Rain/Ice/Snow. The infomedia system is improved from earlier JLR products, with a big, wide screen and clear satnav mapping. You can zoom in and out of the map, but there’s no separate BMW-style iDrive rotary controller to do this easily. There are short cut buttons along the bottom of the screen – even though these can be a little overwhelming as there are ten of them and they don’t have any writing on them, just symbols. The handbrake is tucked away under the right-hand side of the dashboard, and it’s not immediately obvious whether you pull or push this to engage/disengage. 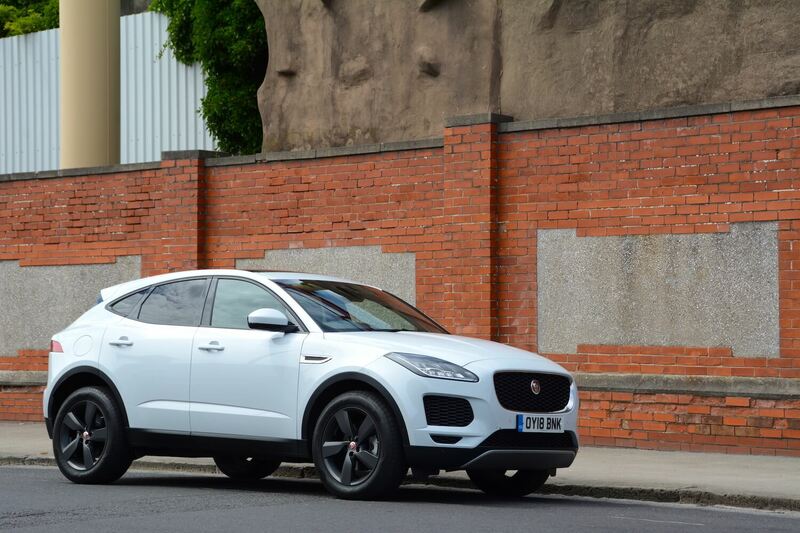 The official NEDC combined fuel economy for the Jaguar E-PACE 150PS Diesel S Manual FWD is 60.1 mpg, with CO2 emissions of 124 g/km. We were able to achieve 55mpg at 70mph on the motorway, but overall after a week of mixed driving we averaged 42.4mpg. The weight and shape of the E-PACE won’t help in the quest for ultimate efficiency. 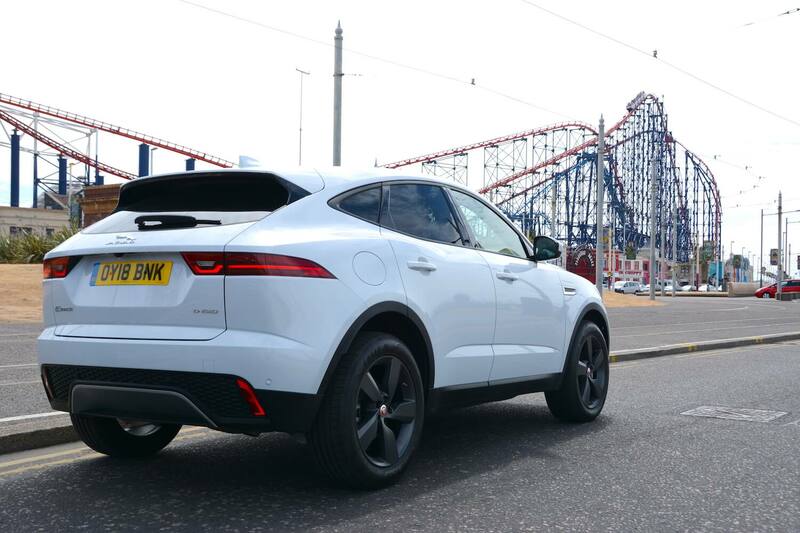 The Jaguar E-PACE 150PS Diesel S Manual FWD costs £28,500, however our test car came with a fairly vast range of options, as follows: Yulong White Metallic paint (£615), Ebony grained leather seats with Ebony interior (£1,735), 19″ 5 spoke ‘Style 5049’ with Satin Dark Grey finish (£1,830), Privacy Glass (£335), Fixed Panoramic Roof (£970), Soft grain leather steering wheel (£55), Parking Pack (£565), Auto-dimming, power fold, heated door mirrors with memory and approach lights (£410), Activity Key (£310), 14-way electric heated, memory front seats (£1,090), Meridian Sound System 380W (£615), Auto-dimming interior rear view mirror (£130), Powered Tailgate (£410), Navigation Pro (£615) and Connect Pro Pack consisting of Wi-Fi Hotspot and Pro Services (£360). All those options totalled £9,990, taking the total cost of the car to £38,490. Powertrain choices are comprised of the D150, D180, P200 and P250, with FWD or AWD, and manual or automatic transmission. Trim levels are E-PACE, S, SE and HSE. The Jaguar E-PACE 150PS Diesel S Manual FWD is a good-looking car, and it’s a nice place to be if you’re covering lots of motorway miles. During such driving, it’s also more economical than you might expect. 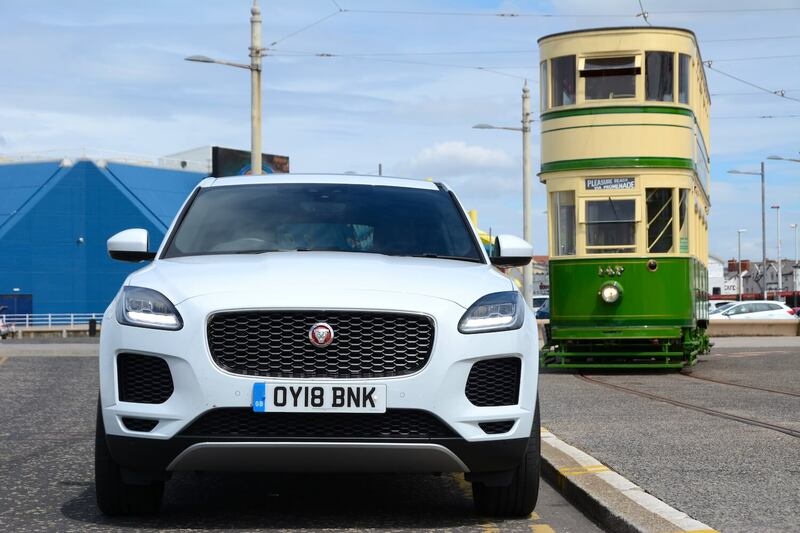 When we tested the Jaguar F-PACE we praised the car’s handling abilities, even though a more powerful engine than the 2-litre diesel would have better complemented the capability of the chassis. 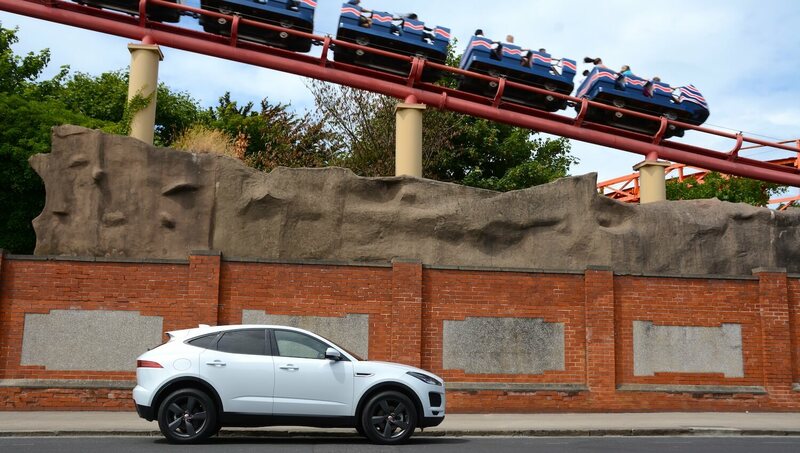 It’s a natural assumption to expect the E-PACE to feel lighter and more agile than the F-PACE, and therefore more fun, but that isn’t really the case. In fact, the F-PACE that we tested weighed exactly the same 1,775kg as the smaller E-PACE. And the combination of the 150PS diesel engine, 6-speed manual gearbox, and front-wheel drive of our test car certainly doesn’t help to accentuate any feeling of agility. 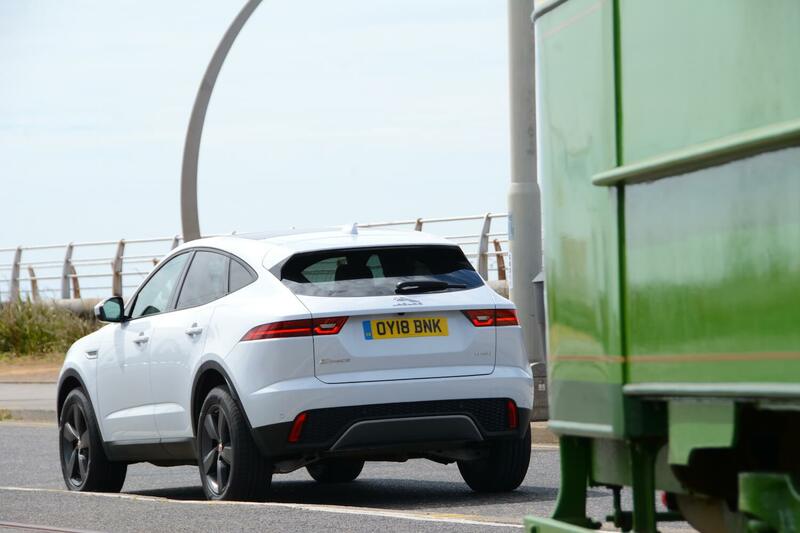 We’d recommend the auto ‘box, especially if most driving is in urban areas (although a diesel engine is recommended for lots of motorway miles rather than primarily urban use). And we would once again make the point that we don’t see why you would develop an all-wheel drive SUV and then effectively disconnect the all-wheel drive system to end up with front-wheel drive; you’ve still got all the heavy and relatively inefficient ‘all-road’ potential engineered in, but you’re not able to translate this feature to the road in poor weather conditions. However many people may well buy this car without having any desire for an agile, fun driving experience, or for any degree of all-road/all-weather capability, in which case it will be a good-looking and practical vehicle. 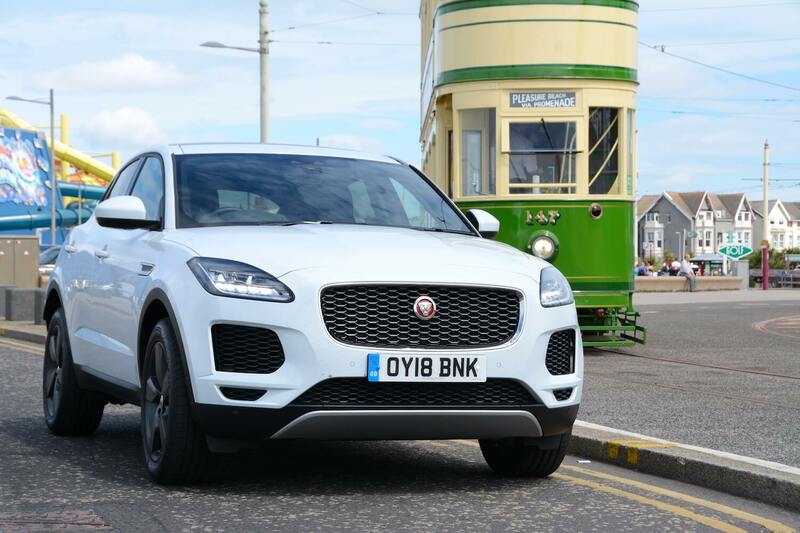 The Jaguar E-PACE 150PS Diesel S Manual FWD gains a Green Car Guide rating of 7 out of 10. 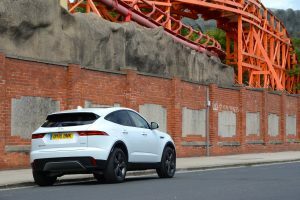 The key thing is that we’ve tested the E-PACE in advance of a full review of the all-electric Jaguar I-PACE, due very soon, which we expect will demonstrate the advantages of an electric powertrain over a diesel engine in a similar sized SUV crossover.